States can have employers enroll in SHOP plans directly through the insurers. Managers of a state-based public exchange may be able to wait until the fall — as long as the day before the start of the 2015 open enrollment period — to provide retroactive coverage for glitch victims. Officials at the Center for Consumer Information & Insurance Office, an arm of the Centers for Medicare & Medicaid Services, gave that update in one of several new documents they released today. CCIIO — the federal office responsible for overseeing most U.S. Department of Health and Human Services efforts to implement the Patient Protection and Affordable Care Act — told exchange managers in February that state-based exchanges could deal with enrollment system problems by offering consumers access to retroactive coverage, along with access to the new PPACA premium tax credits. The federal exchanges run by HHS can use the retroactive coverage guidance, too, if they want, but HHS already has another enrollment process in place for consumers affected by “exceptional” enrollment problem circumstances, officials say in a bulletin addressed to exchange managers. 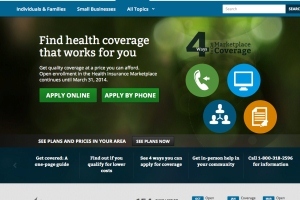 In the same batch of guidance, CCIIO officials said state-based exchanges facing technical problems can follow the lead of CCIIO and let employers enroll in Small Business Health Options Program exchange programs directly with the insurers, rather than making the employers try to enroll in SHOP plans through a broken website. Once a SHOP exchange gets its website to work, it should make employers use the website instead of going directly to the insurers, officials say. In another batch of guidance, a set of answers to questions about HHS exchange construction subsidy money, officials say exchange managers can use money from a one-year exchange grant in a second year, as long as the extension will lead to no extra costs for HHS. But an exchange cannot use the “no-cost extension” money to pay for rent, software maintenance, telecommunications, utilities, or other maintenance and basic operations. In an interim final rule, HHS has spelled out the rules governing when organizations can and cannot help QHP enrollees pay their premiums. Insurers contend that any special efforts to help sick people pay premiums could make claims costs much higher than they otherwise would be. Patient advocates argue that helping low-income and moderate-income people with health problems pay for QHP coverage is a practical, humane thing to do. HHS officials say in the preamble to the new regulations that they share insurers’ concerns about the skewing of the risk pool but will require QHPs and the dental plans sold through public exchanges to let Indian tribes, tribal organizations, and federal and state governments help consumers pay QHP premiums. The penalty for violating the requirement would be $100 per individual per day.